"Former U.K. Prime Minister Gordon Brown plans to increase his focus on global development after stepping down as a member of the parliament at the next election, according to aides who supported him during his term in office. Brown’s resignation after the U.K. general election in May 2015, will end a 31-year career in national politics. However, in recent years the former leader of the Labour Party has increased his development profile, especially on issues affecting children. Shortly after being appointed U.N. Special Envoy for Global Education in 2012, with his wife Sarah Brown he co-founded the international charity Theirworld, which campaigns for universal access to education and encourages business leaders to accelerate progress toward achieving this goal. 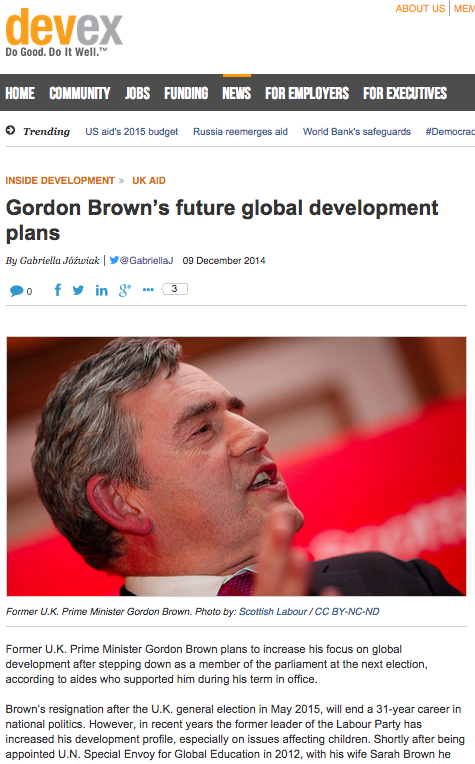 Alison McGovern MP, who worked for Brown as his parliamentary private secretary from 2010 until his resignation and is now a shadow minister for education, told Devex there was “no sense in which Gordon is retiring at all..."